On a perfect early Spring evening, H.E. Ambassador Yigal Caspi, Ambassador of the State of Israel to Switzerland and Liechtenstein, welcomed Hadassah Switzerland into his home in Bern, Switzerland. The evening highlighted the Chagall-Hadassah-Christie’s Partnership to benefit the Specialty and General Pediatric Surgery Operating Theater & Pre-Surgical Unit in the Sarah Wetsman Davidson Hospital Tower. Coming by car and train from Zurich, Geneva, and Basel, our guests were greeted with a cool glass of Israeli wine. They enjoyed a revolving presentation about the Hadassah Medical Organization (HMO) and the 12 Chagall ‘Jerusalem Windows’ accompanied by soft background piano music and were free to enjoy the ambience of the residence’s garden as the sun set over Switzerland’s capital. Following the introduction by outgoing Hadassah Switzerland President Ellen Frick-Delman, the program was an impressive combination of powerful and informative presentations by Prof. Eitan Kerem, Chairman, Dept. of Pediatrics at HMO, and Mme. 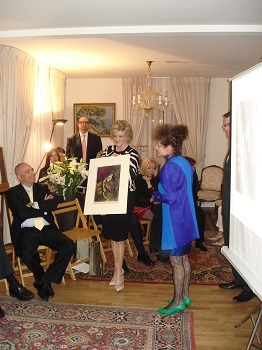 Meret Meyer, Vice-President du Comité Marc Chagall and granddaughter of Marc Chagall. To demonstrate how the partnership works to benefit the hospital, Prof. Dr. Dirk Boll, Managing Director of Christie’s for Continental Europe, conducted a lively auction of a Chagall limited edition, signed litho, ‘Jeremie’ that was donated by Galerie Kornfeld. After some minutes of exciting bidding among the guests, the successful bidder was the renowned art collector, Werner Merzbacher. The program concluded with Ellen’s introduction of the newly elected HS President, Sacha Wigdorovits, who introduced his new Board. Sacha commented as to how he looks forward to his engagement with Hadassah and advancing its mission and work in Switzerland. He also introduced two new Ambassadors, film actor Anatole Taubman (Quantum of Solace) and TV actor, Stefan Gubser (Tatort). Melissa Kaplan, Hadassah International Executive Director, spoke about Ellen’s years of leadership and presented her with a lovely framed certificate in recognition of her contributions. The evening was rounded off with a delicious buffet. Many thanks also to our event sponsors, Kaiser Partners, Zurich & Liechtenstein and RF Executive Search Worldwide for their support by underwriting the event. It was a wonderful finale for the outgoing officers and a perfect debut for the incoming Board!